Today is Thursday and the ideas of healthy dishes are finished. But, we don´t worry, we will help you with the preparation of your menu from Menuterraneo. Today we cook a turbot grilled with vegetables and mushrooms. A delicious main course to fill up your appetite without barely consuming calories. The turbot is a semifatty fish, so that their fat is really low, so it is highly recommended in weight loss diets, because, 100 grams of turbot provide only 3.5 grams of fat and 102 calories. Moreover, sthe turbot contains many proteins, B vitamins and minerals such as iron, potassium, magnesium, phosphorus and sodium and is especially rich in essential fatty acids. 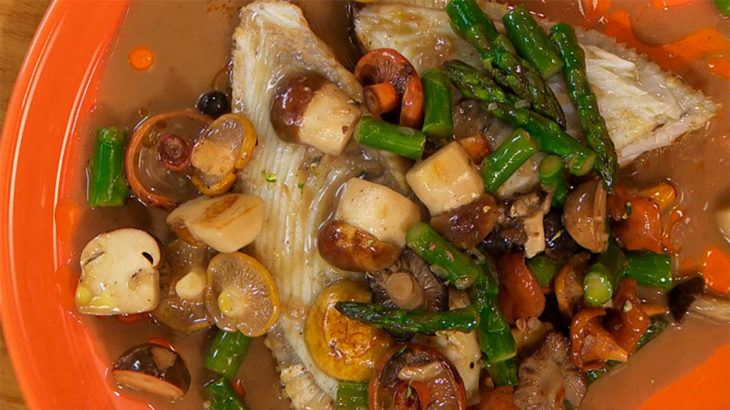 How would we cook the turbot grilled with vegetables and mushrooms? First you must clean very well the turbot and you take the fillets of the turbot without bones. Then, you must clean, peel and chop tomatoes. Following, you boil the green beans and asparagus in salt water for 10 minutes. When the vegetables are boiling, you can pour the vegetables in a frying pan previously heated up with a little oil and you sauté the vegetables. Next, you must add onions, and tomatoes in small pieces. Then you throw out the vegetables from the frying pan, and you fry turbot with a little salt in that same frying pan. Finally, you remove the turbot and you put in the mushrooms in the frying pan. Then you adding now all vegetables with half a glass of white wine and a glass of fish stock until this stock start to boil. Already you have ready an exquisite dish low calorie with great taste! 10 ways to create healthy dishes · 10 ways to eat more seafood · Yes, you can eat more and lose weight at the same time.